OsteoVantage, Inc. has recently been awarded a Small Business Innovation and Research (SBIR) Phase I grant by the National Science Foundation. The $150,000 grant, awarded January 10, 2016, supports the development of enhancements to the company’s INDOS™ system of spinal instrumentation. The INDOS™ system simultaneously facilitates both mechanical stabilization of the spine and osteogenic stimulation of new bone formation and bony fusion. By inducing focal bone formation in areas critical to spine stability, the INDOS™ system has the potential to reduce the risk of non-union and secondary surgical procedures in the >500,000 individuals undergoing spinal fusion surgery annually. The present SBIR project will focus on optimizing electroactive INDOS™ pedicle screws to facilitate therapeutic DC electrical stimulation of the lateral gutter and zygapophyseal joints and encourage posterolateral spinal fusion. OsteoVantage’s Chairman & CEO, Robert Storey commented, “We are grateful to the National Science Foundation for its continued support of this groundbreaking work. This partnership will allow a critical technology to move from benchtop to bedside and create a new paradigm in spinal fusion surgery.” Pilot animal studies conducted by OsteoVantage indicate that the INDOS™ system may double rates of solid fusion in “hard-to-fuse” patient populations. In order to accelerate the commercialization the INDOS™ system the company will be initiating a comprehensive set of animal trials in 2016. OsteoVantage, Inc. was formed in 2012 to commercialize patent pending spinal fusion technology exclusively licensed from Washington University School of Medicine (St. Louis, MO). 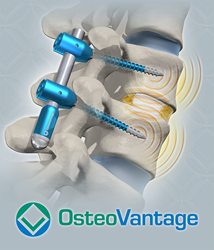 OsteoVantage’s unique spinal instrumentation enhances bone formation at the site of implantation, thereby improving clinical outcomes. OsteoVantage™ is a VIC Technology Venture Development™ portfolio company.